Another general relativity test shows that Albert Einstein was right. Einstein’s General Theory of Relativity predicted that all objects would fall at the same rate. They would fall at the same rate regardless of their composition or mass. A team of scientists from The Netherlands, Australia, the USA, and Canada have carried out a test. Their general relativity test showed that Einstein’s insights into gravity were right. Put simply; they held sway even in the Universe’s most extreme scenarios. Apollo 15 astronaut David Scott dropped a feather and a hammer on the Moon. They both hit the lunar surface at the same time. 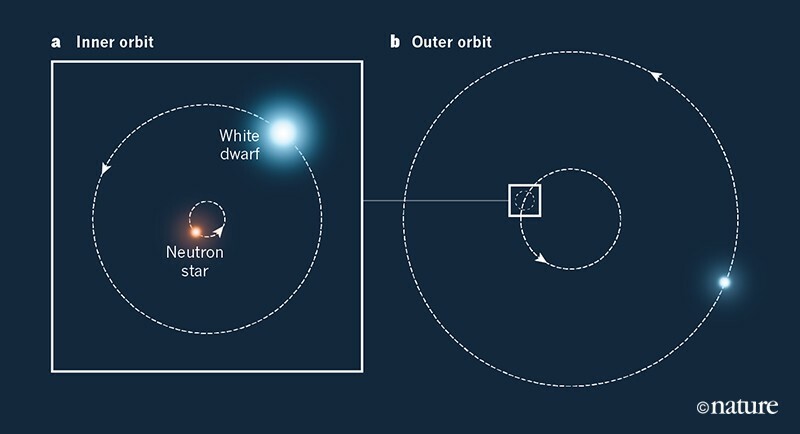 Their general relativity test using a spinning neutron star and a white dwarf showed that Einstein was right. Therefore, his theory applies to everything, even giant objects in outer space. ‘Universality of free fall from the orbital motion of a pulsar in a stellar triple system,’ Anne M. Archibald, Nina V. Gusinskaia, Jason W. T. Hessels, Adam T. Deller, David L. Kaplan, Duncan R. Lorimer, Ryan S. Lynch, Scott M. Ransom & Ingrid H. Stairs. Nature 559, pages 73–76 (2018). O4 July 2018. DOI: 0.1038/s41586-018-0265-1.